Between higher fees and and larger down payment requirements, buyers have to pony up more money than ever these days just to land a loan. NEW YORK (CNNMoney.com) -- Are you ready to buy a house in this crazy market? Better bring a boatload of money to the closing. Higher interest rates on jumbo loans are also making them more expensive than they normally would be - with interest rates a full point to a point and a half higher than non-jumbo loans, said Mike Tacconi, a mortgage advisor with lender CMG Mortgage Services based in San Ramone, Calif.
And buyers purchasing homes for investment purposes are getting clobbered. Lenders are telling them to come up with at least 25% of the purchase price, according to Tacconi - and sometimes as much as 35%, depending on the kind of loan. "Rents are high where I am," said Pennsylvania mortgage broker Hanzimanolis, "so people are having trouble saving enough for down payments." Those high down payments are are being driven in part by the private mortgage insurance companies, according to Jay Brinkman, chief economist for the Mortgage Bankers Association, which have themselves hiked their down payment requirements. These firms insure loans when borrowers put less than 20% down, making lenders whole when homeowners default. In addition, private mortgage insurers are also charging higher insurance rates. Historically, PMI cost about 0.5% of a home's purchase price. Now, a borrower putting 5% down can pay about 0.75% for the first year. 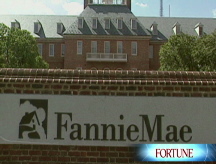 And although interest rates are relatively low, industry experts say that they're higher than they should be, thanks to concerns about the solvency of Freddie and Fannie, which buy about half of all outstanding mortgages in the U.S. The average 30-year, fixed-rate loan carried a 6.37% interest rate last week, according to Freddie Mac, up nearly a point from the year's low of 5.48% set last January and up from under 6% in late May. At the same time, yields on 10-year treasuries, which mortgage rates usually track, have trended down. From June 12 to July 10, 10-year treasurys fell from 4.20% to 3.81%, while mortgage rates actually increased, inching up from 6.32% to 6.37%. Borrowers are probably paying at least a half point more than they ordinarily would, according to Keith Gumbinger of HSH Associates, a publisher of loan information. That's because the questions surrounding the future of Fannie and Freddie have made the investors who buy their loans - hedge funds, pension funds, and banks - wary. They're demanding higher interest rates to take on the added risk they perceive. As of June 1, buyers with scores of less than 620 with less than a 30% downpayment must pay a fee of 2.75% of mortgage principal, up from 2%. Between a 620 and 640 credit score, borrowers pay 2.5% (up from 1.75%); 640 to 660, 1.75% (1.25%); 660 to 680, 1.25% (0.75%); and 680 to 720, 0.5% (0). "The fees are costing consumers a considerable amount of money," said Marc Savitt, a mortgage broker there and current president of the National Association of Mortgage Brokers. All these added expenses are slowing an already moribund real estate market. That means it's going to take even longer to get rid of the tremendous inventory of unsold homes, according to the MBA's Brinkman, especially in areas that were overbuilt during the boom. And these higher costs are going to stick around long after housing recovers, according to Brinkman. From now on, they'll just be the price of doing business.